Fields, a Louisiana native, felt called to ministry at age 15. He received his undergraduate degree at Louisiana College and earned both his Master of Divinity and Doctor of Theology degrees from Southern Baptist Theological Seminary. He was pastor of churches in Louisiana, Kentucky and Mississippi before he began a long career in religious communications. He was editor of the Mississippi Baptist Record from 1956 to 1959 before becoming vice president for public relations at the Southern Baptist Convention’s Executive Committee, where he served from 1959 until his retirement in 1987. At the SBC Executive Committee, he was editor of the Baptist Program, SBC press representative and director of Baptist Press. As director of the news service, he earned a reputation among both secular and religious reporters for honesty and transparency, particularly during the volatile period of denominational conflict from 1979 until his retirement. Veteran religion reporters such as Jim Jones of the Fort Worth Star-Telegram and Helen Parmley of the Dallas Morning News—both now deceased—often praised Fields for his professionalism and his role in making Baptist Press a trustworthy news source. He was a member of the Religious Public Relations Council, the Associated Church Press and the Baptist Public Relations Association from 1959 to 1987, serving terms as the president of each professional organization. BPRA named its annual awards competition in his honor. He was one of the founders of the Religious Communication Congress, an international event held every 10 years. He also was an accredited member of the Public Relations Society of America and served three years as chair of its nonprofit section. 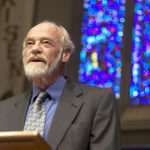 Fields was a trustee of the Carnegie Council on Ethics and International Affairs and a member of Religion in American Life, as well as various Nashville-area service organizations. He was a deacon at Woodmont Baptist Church in Nashville. His passions included flying power planes and sailplanes, fishing and photography. He traveled extensively, visiting 171 countries. He was preceded in death in 2002 by his wife of 56 years, Rebecca Elizabeth “Libby” Hagan Fields. He is survived by his wife, Lawanna Jane House McIver Fields; son Randall Hagan Fields and his wife Nancy of San Antonio; daughter Christy Alderson Fields Batts and her husband Walker of Nashville; daughter Rebecca “Becky” Elizabeth Fields Katz and her husband James of Bumpass, Va.; nine grandchildren; five great-grandchildren; his brother John Paul Fields of Gibsland, La. ; and sister Eva Deil Mabry of Alexandria, La.